The legendary character actor Strother Martin would have turned 94 today. He is one of the most recognizable faces and voices from movies in the middle part of the twentieth century. In 1969, he was in all three of the great westerns that year; Butch Cassidy and the Sundance Kid, True Grit, and The Wild Bunch. Appearing in one of those films would be something to be proud of, being in all of them in the same year is amazing. He worked as part of Paul Newman's troop of supporting actors repeatedly. You will see him in most of Newman's films of the 1960s and 1970s. He also worked in John Wayne films more than a half dozen times in the same time frame. He frequently provided the comic relief in a western, or played an ineffectual businessman or crook. The parts he was known for on television and in the westerns was that of "Prairie Scum". If there was a call for a disgusting vermin from the plains or dirty desert or crawling out of the mountains, he probably played it or was looked at for it. He was one of many Western Actors who would define the image of the old west on TV shows, but also bring home the unpleasantness of real prairie scum with a vengeance. 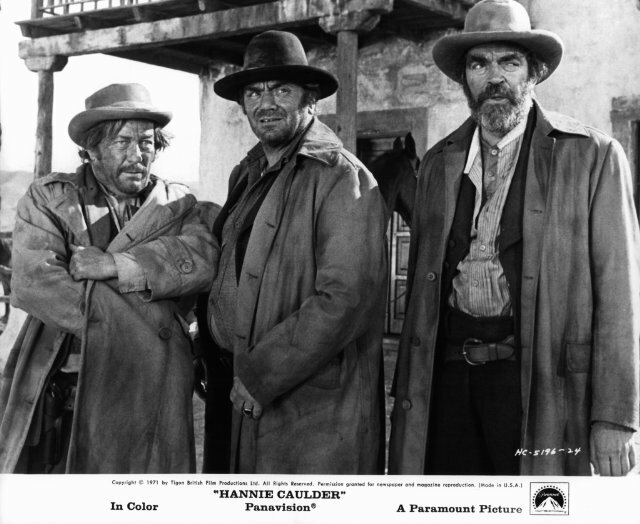 He starred with Raquel Welch, Ernest Borgnine, and Jack Elam in Hannie Caulder. The three villains were not just bank robbers who pulled their neckerchiefs over their faces, they were heartless, self centered cruel men who deserved the comeuppance that the will receive by the end of the movie. In my opinion, it was a great performance that should have been recognized with dozens of awards. It is however number 11 on the American Film Institutes list of greatest movie quotes. As you can see he was often the frustrated loser whol steals a scene and then moves on. 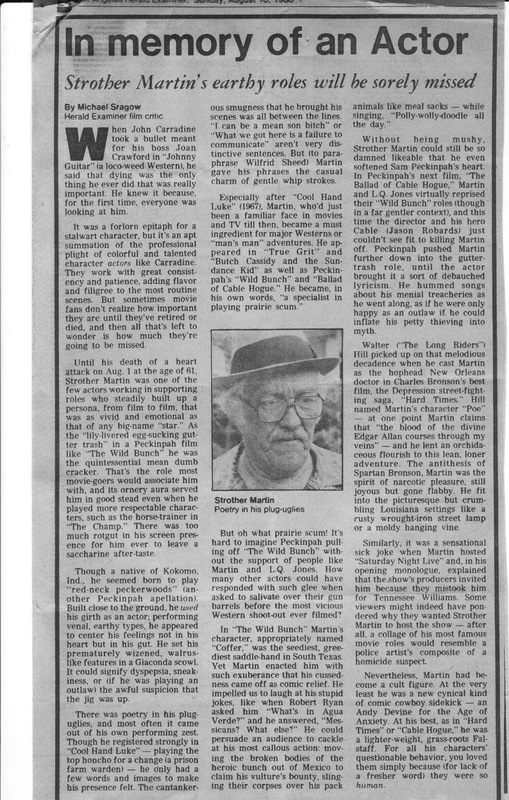 Below is an obituary from the Los Angeles Herald Examiner. Strother died the day before my wedding. He was my Mother's cousin and we expected him at the service. She knew why he did not come, and she did not tell me because she did not want it to overshadow the day. 1980 was not like today with a twenty four hour news cycle. I did not find out until Sunday Morning in the papers when we were on our honeymoon. This article was one of the ones my mother saved. I can't say I knew him well. We visited he and his wife Helen several times out at their place out in the Agoura area of Southern California. I missed the funeral because I was on my honeymoon but we did go to see Helen a few days later and the house was filled with condolences from colleagues in the movie and TV business. I remember reading a very nice note from Lee Marvin that spoke fondly of the times they had worked together. My Grandmother's family had always called him Jay, I don't know if that was a nickname from childhood or if it was a shortened version of Junior. He was only 60 when he passed, and he was still an in demand actor with a pretty good cult following. One of the last things I saw him in while he was alive was the Cheech and Chong movie "Up in Smoke". He was only in it in the first five minutes but it was exactly the kind of film all my friends at the time would be going to. A pretty good illustration of his cult status is the presence of a mural featuring his image in the Rampart section of Los Angeles. by world renown artist Kent Twitchell. Last year I noticed it was his birthday by accident, this year I knew it was coming so I prepared this little salute for him. Actors are an interesting breed, we often feel like we know them when the only contact we have had with them is through the screen. Some actors manage to get under your skin and make an impression on you even if they are not the lead in the story. We know so many of them as "Oh yeah, that guy", it seems a shame that we don't get to know them better. Here's hoping that all the great character actors working today will be remembered fondly as well. I think Jay would have liked that. Jay, my little brother Kirk, and me. 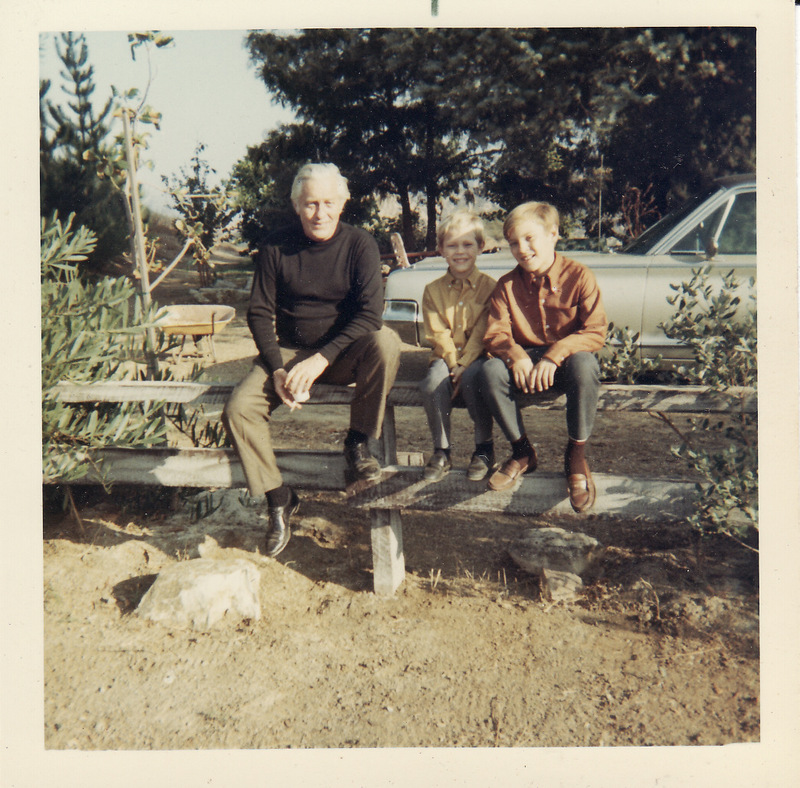 Out in Agoura around 1966. Great tribute Rick! It's so nice that you guys got to see him over the years. I never had the honor to meet him, but I think fondly of him. I know Grandma loved him like a son. Holy cow, man, you were related to Strother Martin? That's awesome, he was great! I love him in Butch Cassidy even if its just a brief part... "I'm not crazy... I'm just colorful. That's what happens when you live 10 years alone in Bolivia: you get colorful." Thanks for commenting Clindy and Dan, I was lucky to get to meet him. I wish my folks had written down their memories so there was more personal stuff to share. Thanks for linking this to me, really touching article. I love Strother in films and smile when I see him turn up in old shows like Gunsmoke. Scene stealer supreme. He's always been a favorite of mine. I was even thinking on doing a piece on him for a character actor blogathon. Loved him in Hard Times as well. 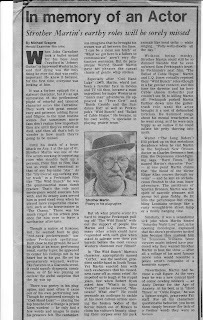 I still have a small obit from a Canadian newspaper from when he passed away in a scrapbook around here somewhere. Thanks for sharing. Mike, I know you are a lover of the old timers and of the path less trodden, so I thought you might appreciate the post. Thanks for letting me know that you made it by. I understand that he was a closet intellectual; that he loved classical music and shared it with friends. I've seen early photos when he was called "T-Bone". Really elegant photos of a beautiful, disciplined young man in full form as an awarded swimmer. I also think it would be interesting to know what stories he could tell about the classic actors and actresses he knew when he taught swimming privately to stars and their families in Hollywood. He said he was deeply fond of the great Marie Dressler. 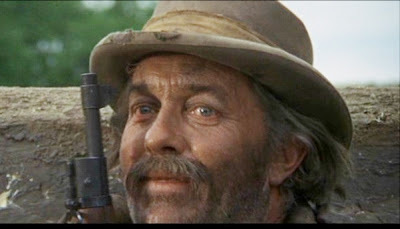 Too bad Strother Martin didn't get better parts, and too bad he didn't live longer. Some people just shouldn't die. Gail, you are so right , some people shouldn't die. That's why we have to kee his memory alive. Thanks for visiting and for taking the time to leave a heartfelt comment. W.W. and the Dixie Dance Kings. Fog's Movie Reviews Need Your Support.